Every year I wait patiently for the Lewisia rediviva (Bitterroot) to bloom. This year it’s been a long wait. Each time I go on an adventure around the property I get down and examine the plump succulent leaves. Tiny bursts of green against the rocks they sprout from. Like juicy fingers clambering for the Spring sun. I’ve been watching and waiting and searching through the photos of the past to gage when I could expect the vibrant blooms. The wild stone crop faired well over winter and all the leaves are full and green. Some of the usually small and struggling plants have taken on miniature shrub status. But still, no Bitterroots. I was beginning to think I may have missed them. Perhaps I got the timing mixed up and maybe I had my information all wrong. Many flowering plants die back after their showy blooms open up. All the energy required to put on such a visual display of power and life, it’s too much to sustain. So the plant goes dormant or often dies completely. At least it’s this way with succulents. I feel like I need to be there, acknowledge their strength and will, honor their life, sit with and see their beauty. Missing a bloom feels a bit like missing a visit with a close friend. The ones that die off…well, you can ask my husband, I’ve cried a few times when I’ve missed their climax. Ellie came in today yelling and yelling, amidst the chaos and bustle of coming home from picking up her brother, and I bristled. I’ve been running all directions lately and my well-being is a bit parched. I felt frustration rise, the noise and busy of it. I almost snapped. Then I looked, I looked up from my phone timer, set for frozen chicken nuggets, and saw her face. She beamed. The brilliance of pride danced in her sapphire eyes. Her tiny hands held two bouquets. One yellow and one a glorious magenta pink. I didn’t miss it. My beautiful daughter was watching too and even as I imagined she wouldn’t remember from last year, she watched. Ah, yes, the better roots. My sign of a beautiful summer opening up for us. The flower that can withstand an entire year without water and burst forth in a show of triumph. The flower that sacrifices its leaves to open its face to the sun. Native Americans used to time their migration with the bloom of the Bitterroot. It’s roots were so valuable you could trade a bag full for a live healthy horse. The Bitterroots are blooming. 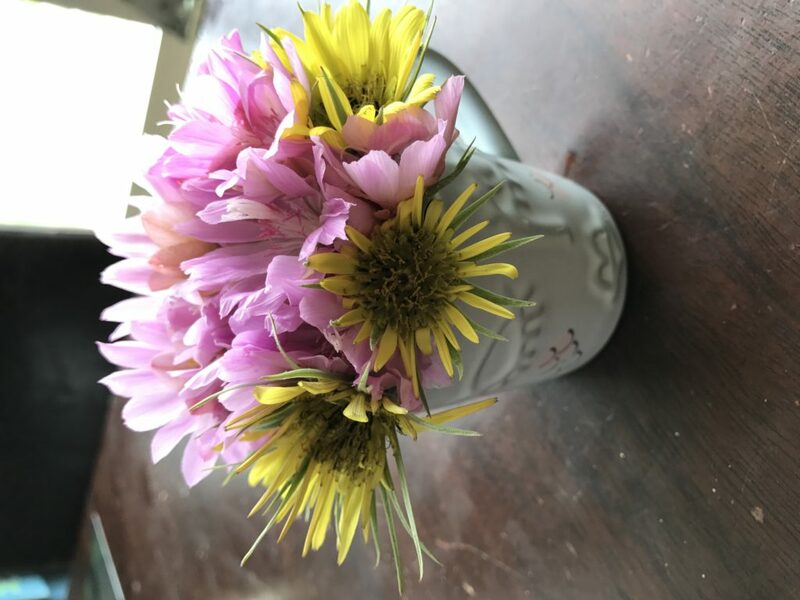 I stuffed her bouquets in her special mug and then went out to visit them. They don’t last long and because their leaves die when they bloom, by next week, there will be no sign that they even existed. Just dried up crepey vestiges of their beauty, blown by the thoughtless wind. The stone crop appeared happy to be standing so tall and full among its long lost friends. The rocks even appears proud, with their tiny pink crowns and showy sprouts. My dried and cracking self plumped right up. It’s not about the flowers, the waiting, the hope. It’s about the tiny pieces that pull together to create the loops that make it worth being present. The micro moments that remind me that I can choose not to be parched. I can choose to look up and see the smiling faces or the sad crying faces. I can choose to let go of the loneliness fed by looking into a device. I can choose to bloom without water and push past the need for leaves to hold my worth. I can choose. It doesn’t matter when, it always works out. The Better Roots are bloomed. 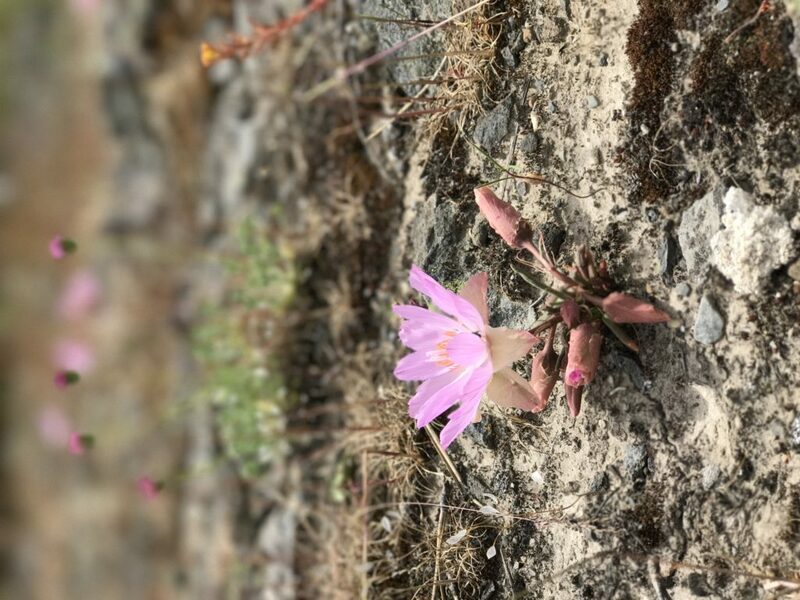 This entry was posted in Meandering Musings, Mom Life, Ontology, Parenting and tagged acceptance, Bitterroot, choose, daughter, get real, grateful, inner struggle, inner workings, introspection, it is what it is, Lewisia reviva, parenting.